June Update - overgrown JUNGLE! 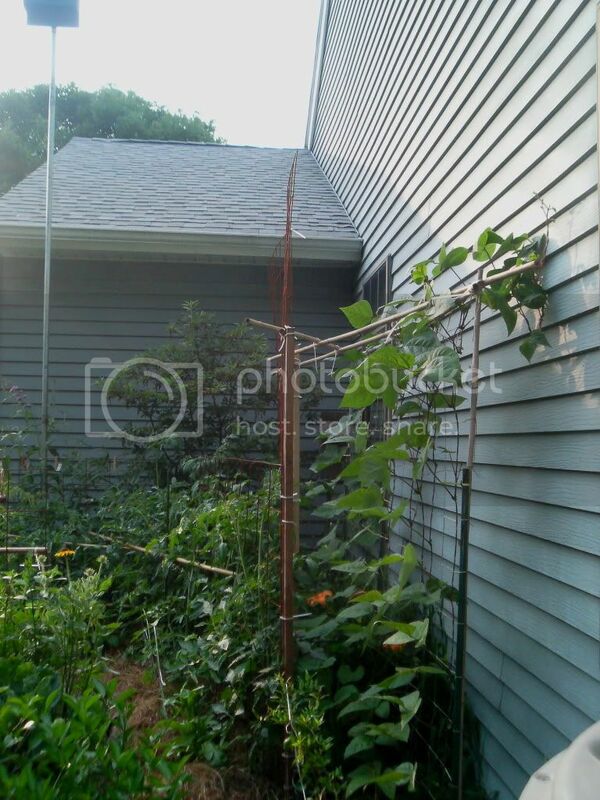 8'x12' former Sunflower House: Tall Telephone peas along near fence with onions. Double Red Sweet corn in between. Watermelon in the corner (not sprouted), Cauliflower, then Garlic along left with another Chinese leeks, a few onion seedlings, Red Russian Kale, Windsor Broad beans, some more on the other side of entry, volunteer Purple Podded Pole beans, scattering of Dill, Spinach, Carrots, more Double Red Sweet corn, Parsley, Lincoln peas along right edge under bamboo support, Caraflex cabbage, Cauliflower, Red Acre cabbage, Red Russian Kale under the row tunnel along with a few Lincoln peas, and spinach. Planning to plant peanuts and Delicata squash here later. Onion. A cotton plant is hardening off under the tunnel to be planted in the near-right corner. -- June Update from the same viewpoint. 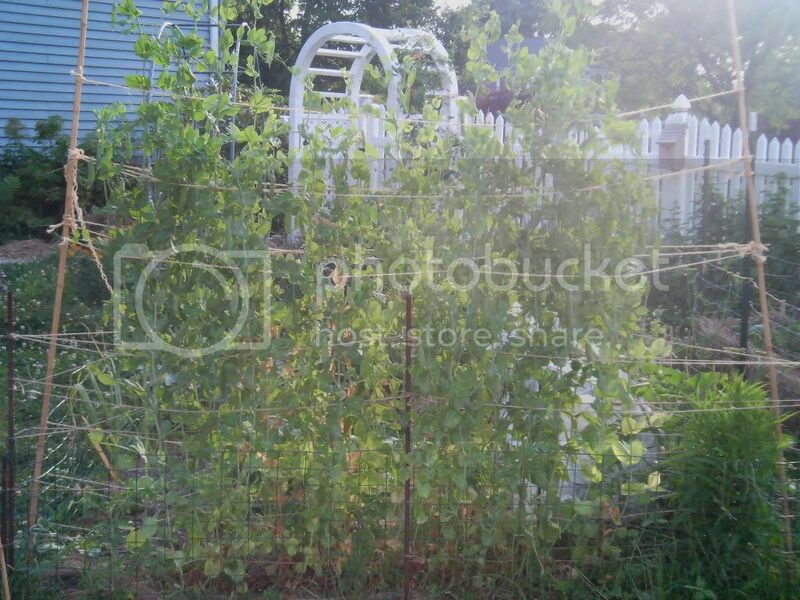 Tallest peas are 6'+. I found a bag of blue seed potatoes sprouting in the fridge. I've no idea if they're still viable (the shoots and roots look fresh), but I've nowhere else to plant them, so I tucked them under the pea mulch. If they manage to establish and sprout, I'll pile some compost and hay over them. 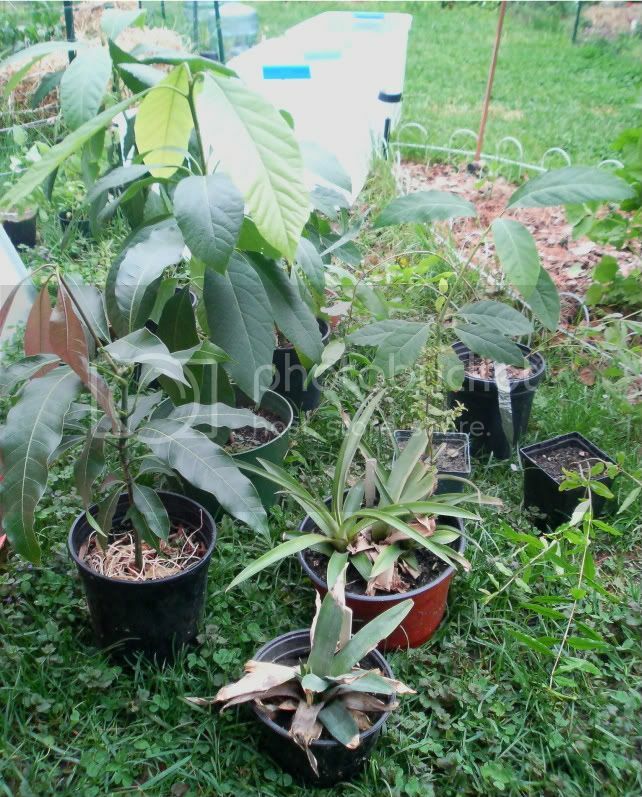 My "tropicals" grown from seeds and tops: Two kinds of Pineapples, Mango, Avocado, and Pomegranates. Citrus collection is elsewhere. Rumex crispus and dandelion are growing in the espalier fence row as dynamic accumulator and mulch plants. Grass along the fence is cut and used as mulch as well. All along the OTHER side of the fence -- California black-eyed peas. Last edited by applestar on Sat Jul 17, 2010 12:17 am, edited 5 times in total. Look like you have been busy. You have quite a variety of stuff going as well. looks like everything is doing well, something I can't say about my garden. Wonderful! I love how you garden, AS! I don't know anyone who gets more different stuff in an 8' circle! 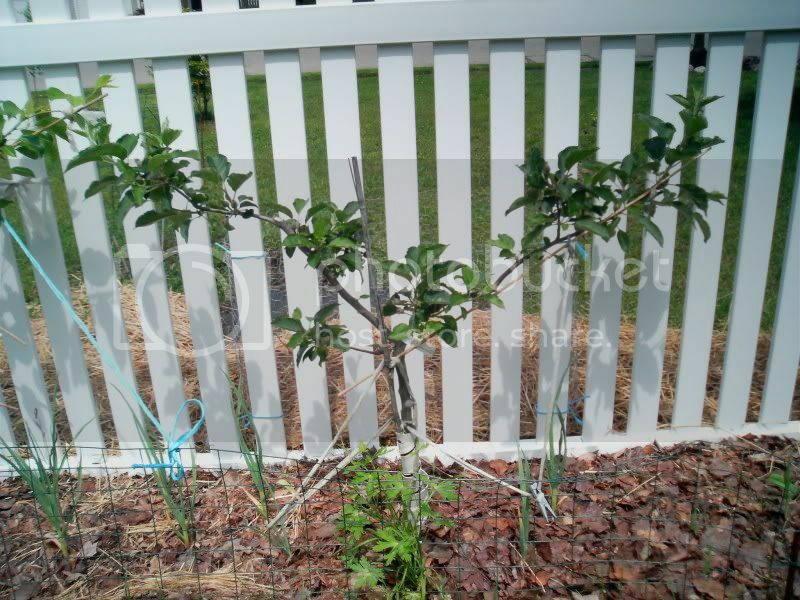 great job applestar, love the espaliers. i have an apple on going myself. NICE!!! It all looks fantastic... thanks for sharing!! My goodness...you're headed to no grass at all!!! Yummy, raspberries and blackberries, too. What haven't you planted!!! I love how much has self seeded!!! Are you doing any rice this year? Love the "tropicals"! I am so far behind!!! Your key hole area is amazing! You are amazing!!! No way you got a turtle named Mr. T! Thats cool. Just got 10 lbs of sunflower seeds. Probably will have a few thousand sunflowers growing from now until fall sometime. You will be so jealous. Thanks! It's a work in progress, and every year, I seem to eliminate another patch of lawn or two. I've mostly staked out the garden beds in the backyard and have moved out into the front yard. I'll post some photos of that later, after things grow up a bit. 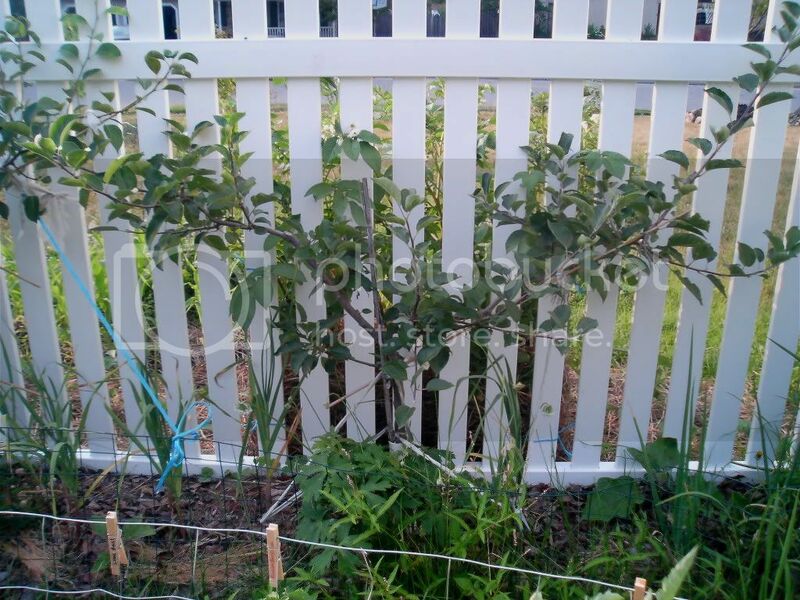 But I posted a list of plants that went in the new "Front Fence Row" in reply to Attractive veggies for front yard? thread. This year's rice is in this thread. Not much going on yet though I AM pulling out the imposter red stemmed grass. Speaking of grass -- I'm trying to grow some Moso bamboo seeds. I blithely used my usual homemade seedling mix. BIG MISTAKE! 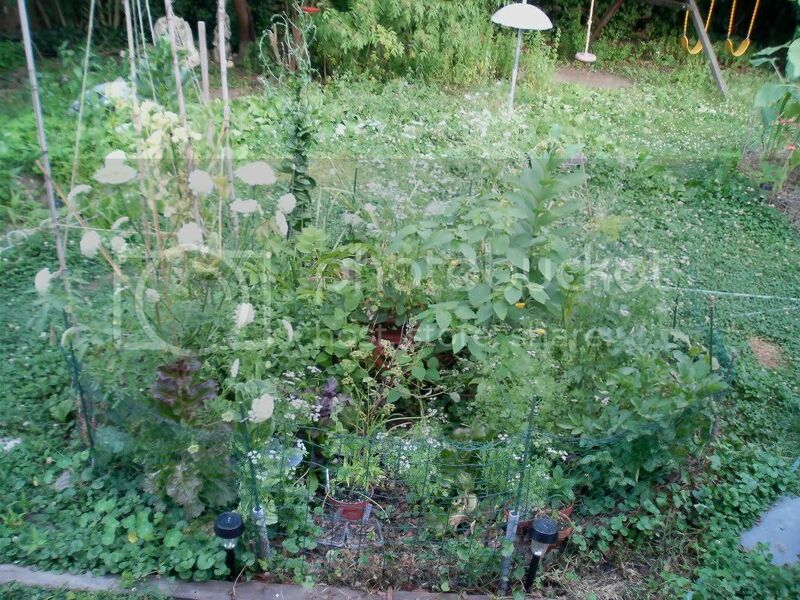 My seedling mix is NOT weed-free. I now have grass-like weeds growing in these pots and I've NO IDEA which one is, or even if ANY of them is bamboo.... At this point, my plan is to just keep growing them and see which ones grow the tallest. Oh, and here's a thread about Mr. T with some more photos. 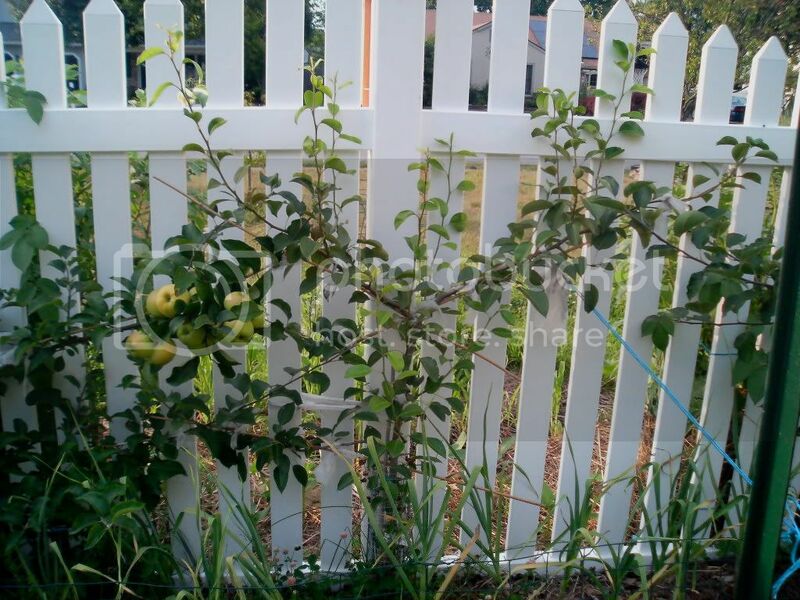 Applestar....your front yard sounds like it will be Beautiful!!! I'll be watching for updates! Thanks for the link to your rice thread. Oh my...bamboo Is Moso bamboo easy to contain?!?! I love the look of bamboo, but shudder when I think of how invasive it can get! Hmmm....if Moso isn't invasive maybe we could plant a bit in Florida!!! Good luck with finding the "real" bamboo. 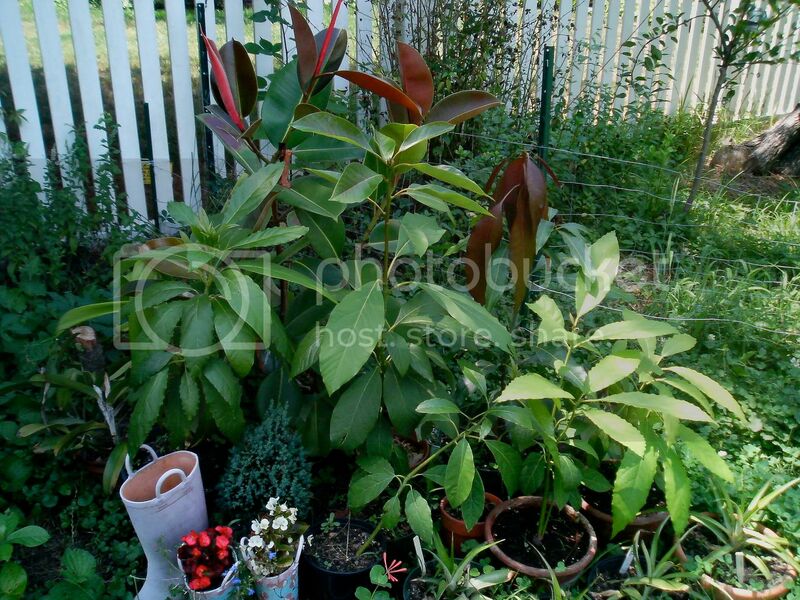 I love how you "get into" every aspect of gardening!!! "Mr. T" looks quite content!!! 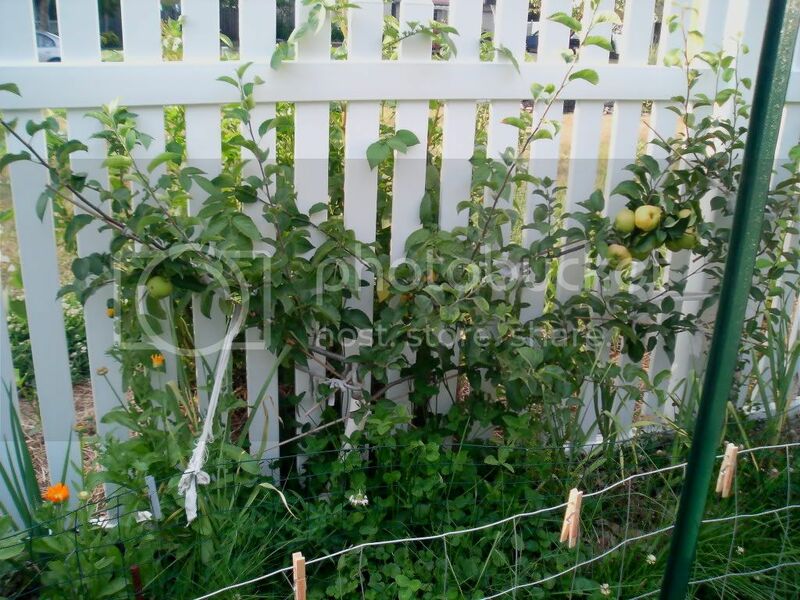 i esp like the espaliers, as i haven't brought myself to do them at this point..i think about it..but when i get my apples or other fruit trees..i just tend toward planting them smack in the middle of my gardens..and plant around them.. 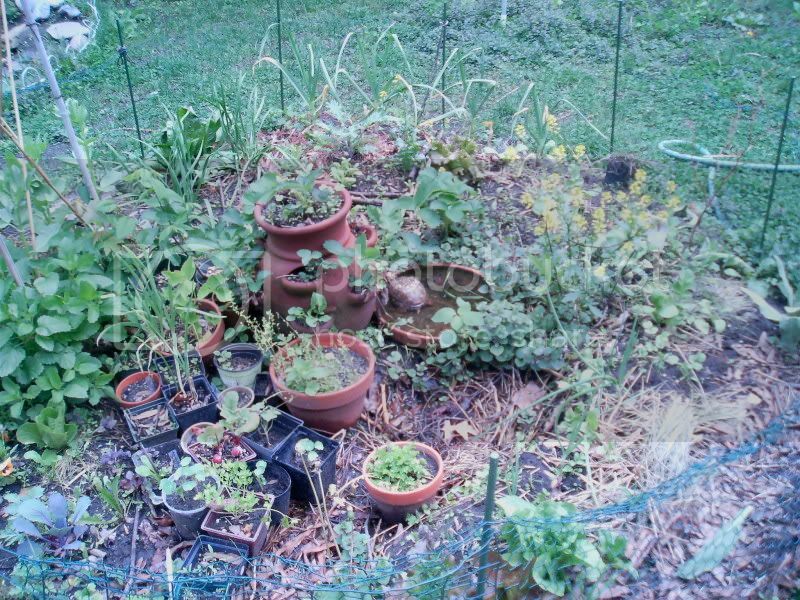 I love the espaliers, but like Brenda, I tend to plant in my present garden, hence, if you look too close at some tomatoes, you see the peach limbs hanging down, loaded with fruits. I really need to borrow you for a few days to figure out what needs to go where. Could you handle planning out a huge area? 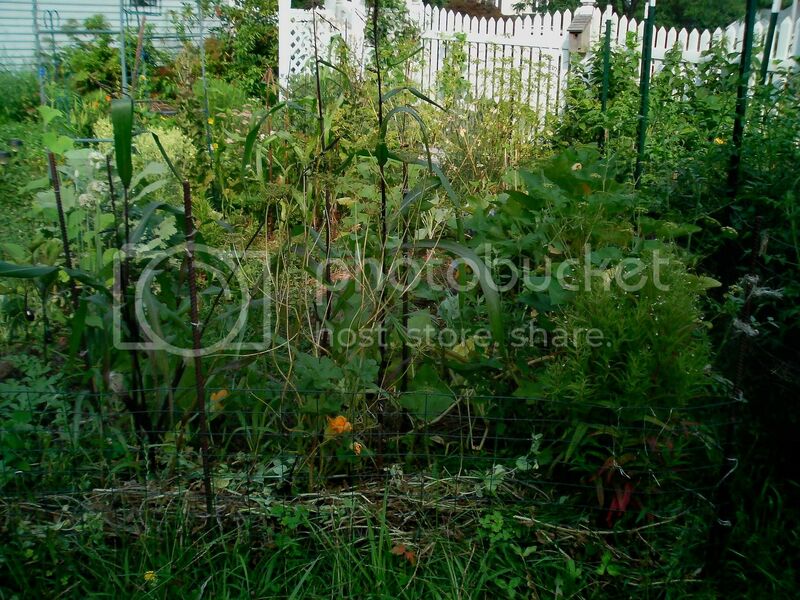 Nearly 3 acres, between house, outbuildings and gardens. You people with your acreage! Go ahead, make me jealous! 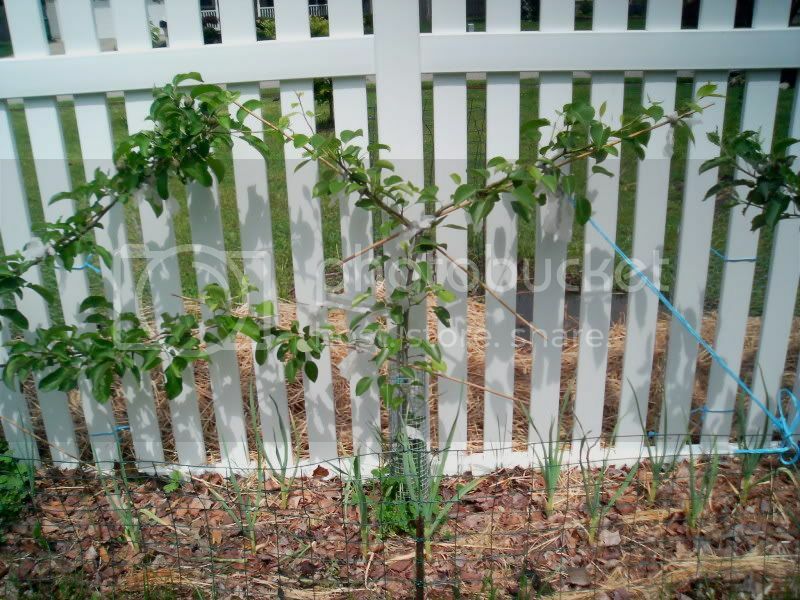 But I can say I have 3 apple trees, 3 European plums (almost didn't mention them because these are useless! One is coming down this year, to be replaced with Northstar pie cherry tree ), 2-1/2 pear trees (2 are not fruiting yet, 1/2 because the whip pear (Tyson) planted last fall came down with fireblight and I had to cut the top 1/3. It's down to a stick with undeveloped buds now and I'm waiting to see if it recovers), 1 peach (with developing peaches! ), 1 mulberry (laden with fruits -- the catbirds visit every day to see if they're ready ), 1 serviceberry, 1 nectarine (no fruit), 1 persimmon (flowered; waiting to see if they turn into fruits), 1 Chinese apricot, and 2 cherry trees (not fruiting yet) in my 3/8 acre suburban lot. 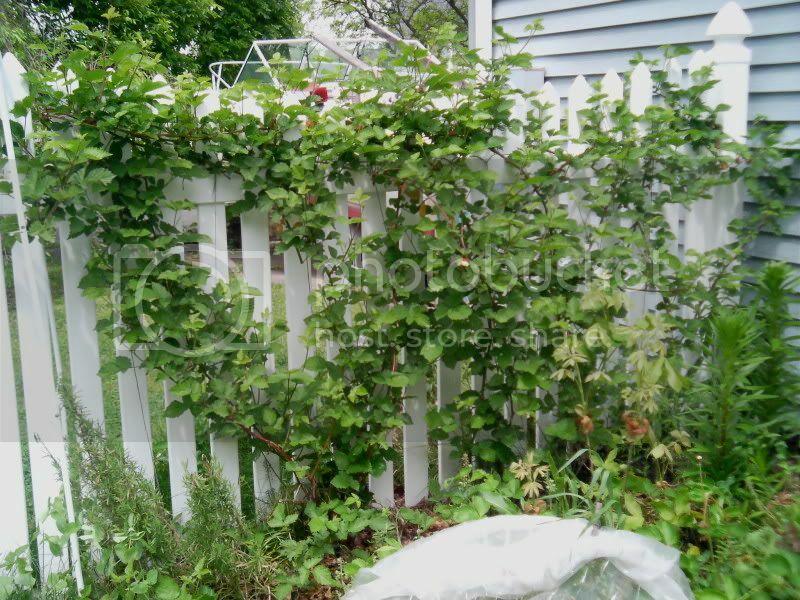 In addition, I have 1 June berry shrub, 11 blueberries, 3 raspberries and 3 blackberries quickly turning into a rows, and 4 beds of strawberries. More stuff I haven't mentioned, too, but yep, I'm packing them in as fast as I can plant them. Oh! Forgot the PawPaw -- one is struggling to grow. The second one died so I have to get another one. Nearly 3 acres! I'd love to listen in and watch you develop your planting designs. I'll speak up if I have anything to contribute. Apple, nothing to be jealous of. You have more in your yard than most of us do, acreage or not. Having acreage, just means you have to walk farther to where you are going! Not any more productive! And you would work yourself to death trying to make it all awesome, like your yard! You're probably right OL -- I get tired enough as is, walking/working around my tiny garden. 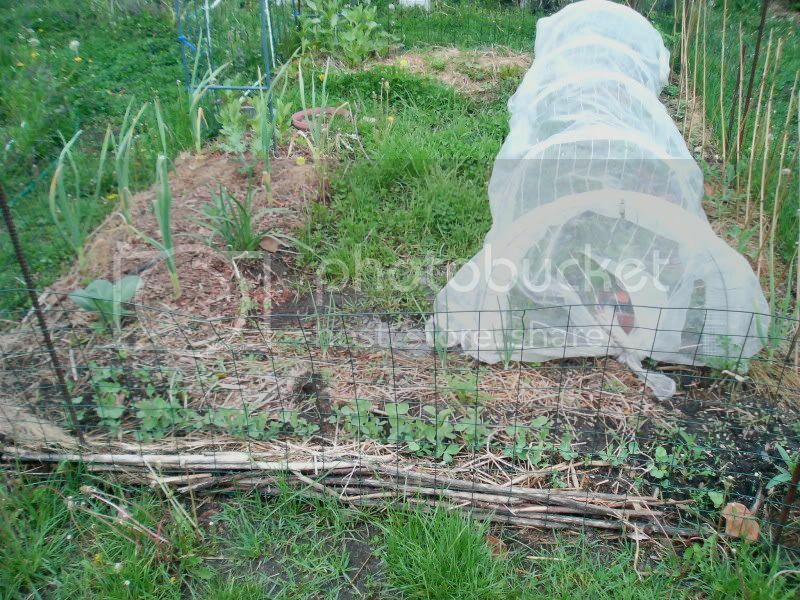 I finished my New Tomato Bed area, with concrete reinforcing wire fencing (NOT rolled into cages) doubling as one side of the vertical trellis sandwich for Luffa. 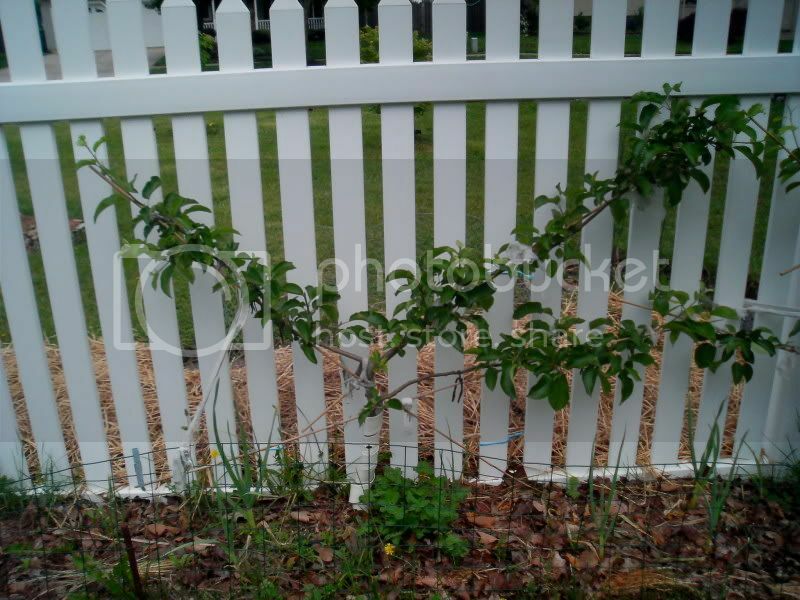 (the other side is a string trellis). Concept is to grow the Luffa in what will become an inaccessible area since they won't be harvested until much later. 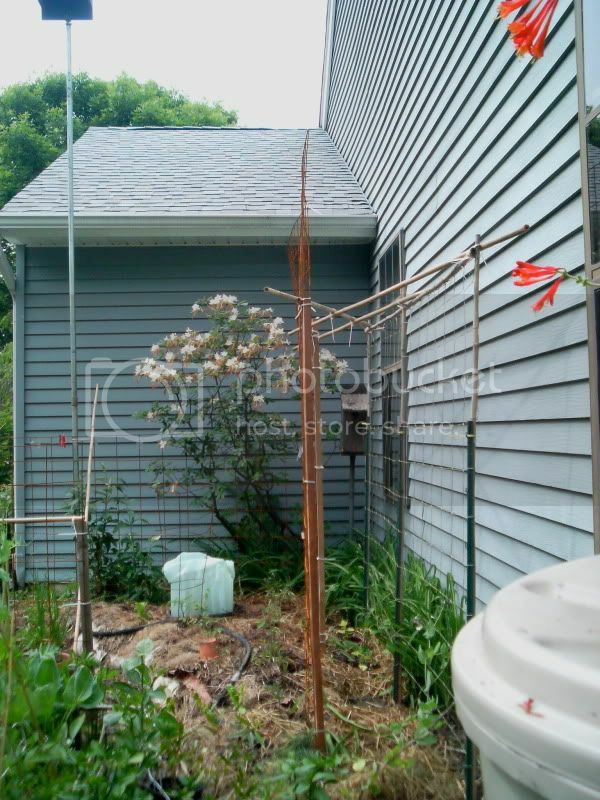 The 7' trellis hopefully will be covered by Luffa as well as the tomatoes and will shade the hot Southwest wall of the family room. 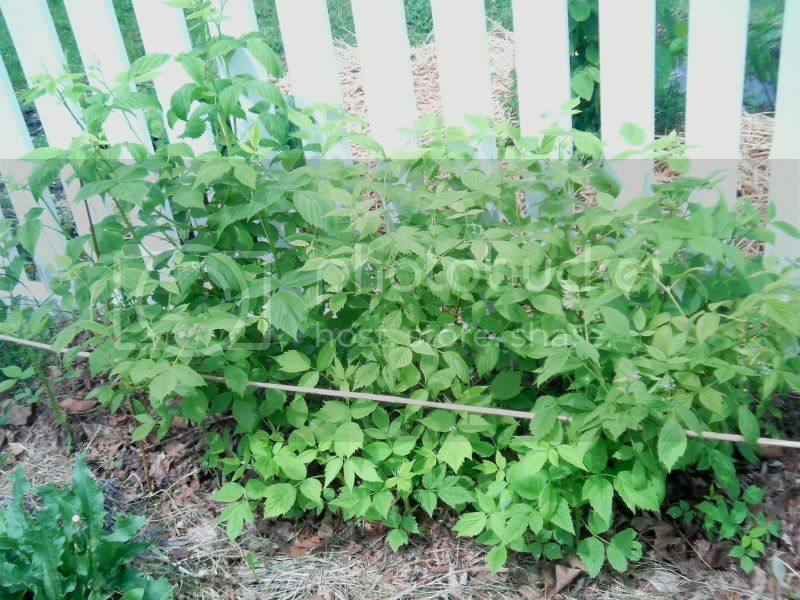 The string trellis, 1' away from the house wall, will help keep the vines away from the wall and provide for air circulation. 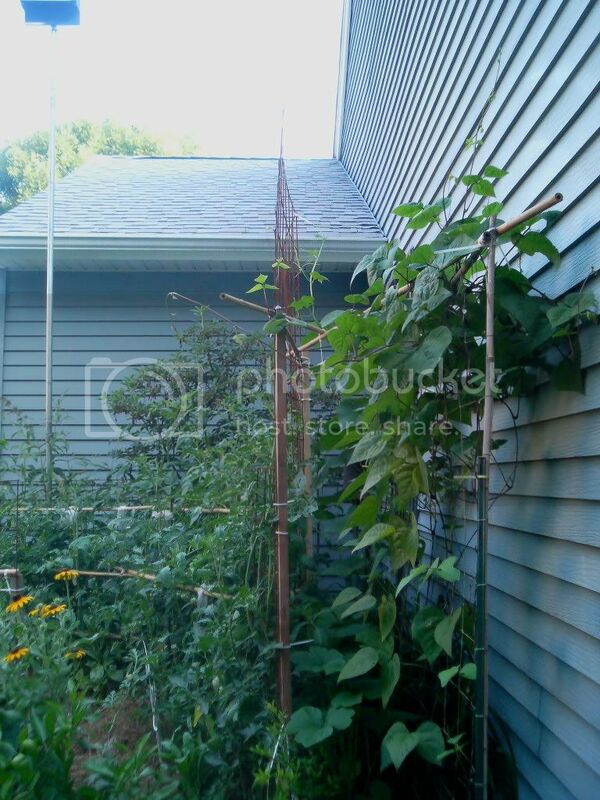 Am growing the Purple Podded Pole beans in the more accessible section of the trellis since they'll be harvested throughout the season, except for the hottest part, if last year's performance is any indication. (This will all work out as planned or else that whole side of the house is going to turn into an absolute jungle! ) I'll post photos later so we can compare the BEFORE and the AFTER. cherlynn wrote: Hmmm....if Moso isn't invasive maybe we could plant a bit in Florida!!! 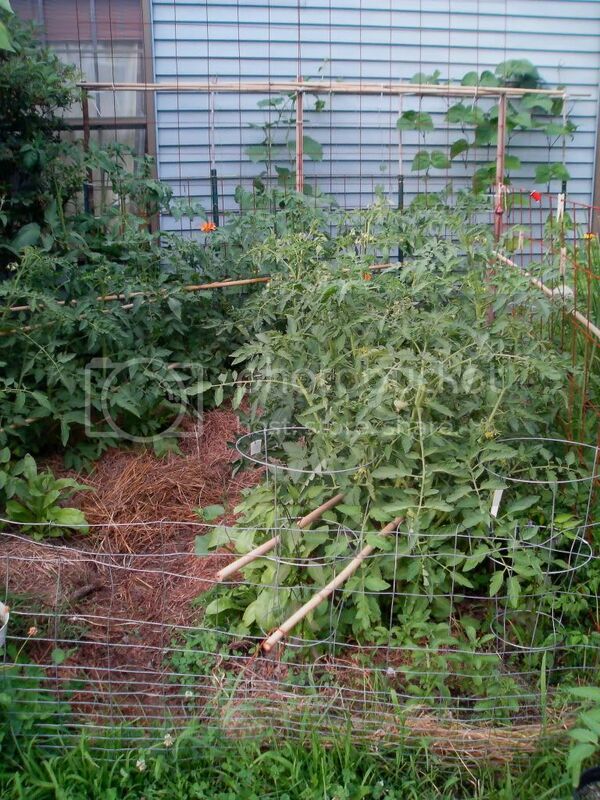 Here's a photo of the tomato/luffa trellis. Yeah, space is tight as usual. Luffa -- funny story: I've had two starts growing in 1 Qt deli containers. 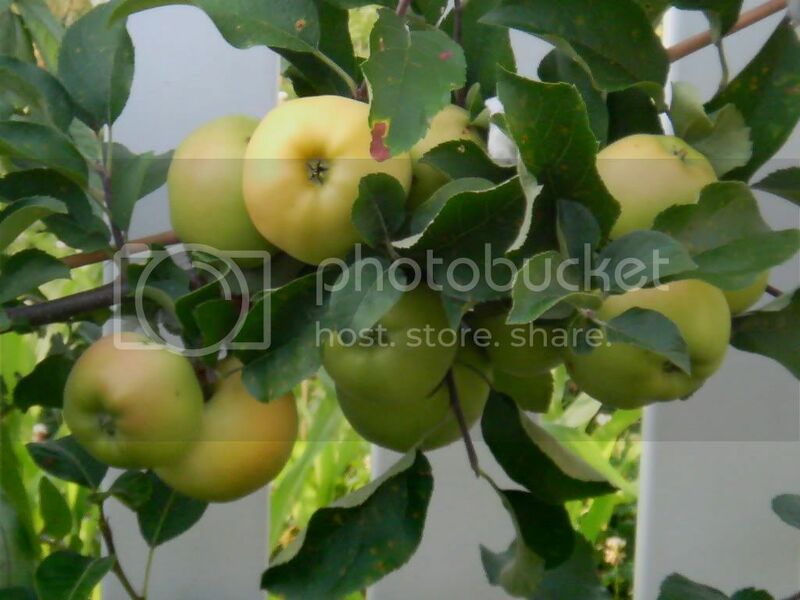 They were languishing -- pale leaf color, etc -- due to some error in soil mix. I was looking everywhere for the rest of my seeds to plant between the trellises, but no matter how much I looked, I couldn't find them. I did already sow some seeds by another trellis, but I'm pretty sure I had some left. So I finally realized -- I should just PLANT the seedling starts. They'll be out of the container mix that is most definitely NOT working, this area has the warmest micro-climate because of the protected Southwestern exposure, so despite the high 40's/50's nights for the next week, it should be OK, especially with cloche to protect them. PROBLEM SOLVED! That White Swamp Azalea (fabulously fragrant flowers) had 3 of the Praying mantis ooths (egg cases) in it. I see the little ones running around occasionally, so the tomatoes and the luffa should be safe. I posted a new thread/update about this project here. Last edited by applestar on Sat Jul 17, 2010 8:13 pm, edited 3 times in total.